In mid 2017, we did some soul searching to determine who we really wanted to be as a company. That meant we needed to really define the problem we were solving, and for who. How do we identify our target market? How do we best relate to and engage them? What is the common problem they have, but might not be aware of? What defines success for our customers when it comes to using our offering? We were fortunate that at the time we had a few hundred customers already to put under the microscope and look at what was similar between the our "best" customers. By best, I mean the companies that are getting the most value from us, and seeing the best results. Taking a look at the way our "best" customers were using us to get maximum value, we saw that it was primarily companies that understood the true value of delivering product knowledge from their team to their user base. 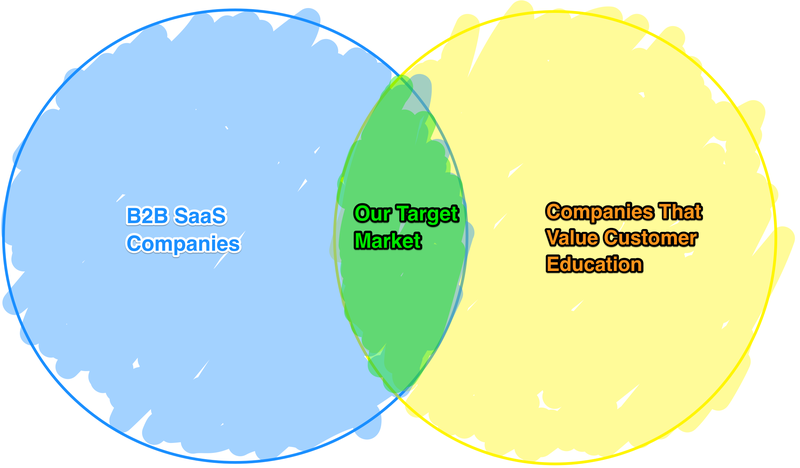 While we have customers in a range of verticals, the target we wanted to initially aim for and saturate was B2B SaaS companies, who understood the power of user education and its efficient delivery, because that's what we do, well. While this was laser focused which is a good thing early on, in reality it also proved to be self limiting. We'd identified a market, but our target was a subset of that market that had the same core value as us in terms of the importance of educating users. It's not a clean crossover. When we'd get on the phone and chat with customers or other founders, it was almost black and white comparing people who "get it" when it comes to delivering user education to users, and those that haven't come to the realisation yet, or have been clouded by its symptoms and can't see the forest for the trees. Typically, larger companies understand, since they've been around long enough to have had the "aha moment", and likely wouldn't have grown to the size they are without that realisation, but it's also starting to be a trait in companies with a large focused vision, that they need to educate their users in a scaleable way, and they need it to be part of their DNA rather than an afterthought. Smart companies understand that hoping people will just "get" their product on their own, or put in the effort to seek help when they get stuck, is a poor game plan. When you see a company that values user education highly, it's obvious. It dawned on us that we can't assume that everyone will immediately understand the importance of user education, it's often not until it manifests itself in a myriad of symptoms like support loads increasing, poor conversions and engagement, or suboptimal retention, that it's true importance is comprehended. We need to help people understand, we need to educate the market. User educations is such an important discipline for people to understand and should be an integral part of their product thinking that we feel it's our duty to educate other companies on the importance and positive impact that it has on their user engagement, retention, and the flow on effects that come with it. Our reward for this effort is that as we're doing that, we're actually both creating and expanding our own market. We're bringing people into the cross section of the market we're going after, and those who intrinsically care about educating and nurturing their customers. The more we educate people about the discipline of user education, the more we grow that crossover and expand our target market. What's more, we can do this in a measured approach by teaching people in a given market or vertical (say, B2B SaaS apps), and when we feel we've educated that market enough we can expand to another market (say, virtual learning environments, or analytics platforms) to show them the benefits of user education, and how they're leaving so much on the table at the moment. The sky's the limit, and we're only limited by our efforts to expand our own market. How can you apply this approach to your company and market?